I traditionally go for any shortcut I can find in the kitchen. But lately, I’ve found that the quickest route may not necessarily be the best. I have learned hard lessons about Pillsbury pie crusts and Minute Rice compared to their homemade counterparts. But my latest conquest, even I was dubious about. I’ve also mentioned that my husband has taken to cooking over the past few years, and one of his innovative projects I just could not get behind. Namely: making homemade broth. I reason, if the Swanson’s people are nice enough to perfect their own seasonings and give us convenient broth in cans, and now in handy cartons, who are we to go to the grocery store and ask for the stuff they’re throwing out in order to create our own stock? So we bought a rotisserie chicken at the grocery, pulled off all the meat, and made a chicken pot pie for dinner (using a leftover pie crust from a previous self-improvement project! See, it all comes together). The next day, noting that the recipe suggested a cook time of two to six hours, I worked from home, kicking off my day as I tossed the carcass in a Dutch oven, covered with water, and kept at continual steaming but not boiling temperature for several hours. After those hours had passed, the recipe suggested adding a number of spices “if, and only if, you happen to have them available.” Mister, you are obviously not familiar with the random assortment in my kitchen. We always have garlic and tomato paste and cracked black pepper available. So while not a straight-up mirepoix, I tossed some seasonings in there, and simmered for another hour. Once the stock was strained, we conducted a family taste test, which was a completely unfair battle. As one of my all-time favorite movies puts it, “and then came the dawn.” Placed side by side, the homemade stock wiped the mat with store-bought. Said one of my testers, the paler stock “didn’t taste like anything.” It did, actually: water-flavored water, with a dash of salt. Like with the pie crust, like with the rice, using this recipe is certainly more complicated than the easier method of opening up a carton of broth. But the results are definitely rich enough to be worth it. Why, right now my husband is using the stock I made to create a fortified stock, which is stock created using stock, for a cassoulet. What could be next on this self-improvement journey of mine? The way things are going, I’ll probably be squashing my own wine grapes or roasting my own pig before summer is over. In the meantime, when the occasion arises, I will certainly take the few moments to toss a carcass in a Dutch oven to make a fairly easy and clearly superior chicken stock. As a bonus: Your house will smell amazing for several hours. 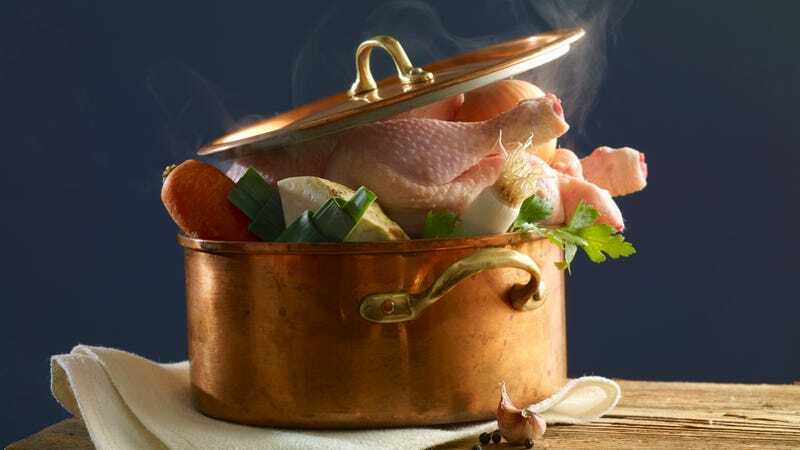 Cut or pull the chicken carcass into pieces so that it fits into a 2-quart pot. Cover the bones with cold water. Put them over very low heat for 2 to 6 hours, just enough to keep the water heated to 180 or 190 degrees Fahrenheit (but not simmering). Add the remaining ingredients and cook for another hour over low heat. Strain into a clean pan or a 1-quart container.